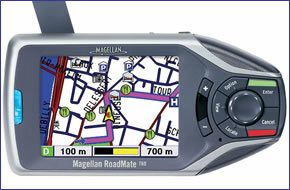 The Magellan RoadMate 760 includes expanded map data for 27 European countries. GPS navigation is easier than ever with your Magellan RoadMate 760. Turn-by-turn voice guidance with SayWhereT text-to-speech technology tells you when to take that next turn, including the name of the street and distance to the turn. Accessories, spares and parts are still available for your RoadMate 760. For the latest range of car sat navs click here. The Magellan Roadmate 760 GPS satellite navigation system features simple menus to enter an address on the touch screen, or find nearby petrol stations, restaurants, car parks and more by selecting from almost 1 million pre-programmed points of interest (POI). The RoadMate 760s' SmartDetourT feature, on demand, will route around stopped motorway traffic. Choose roads you want to avoid and your Magellan RoadMate GPS navigation system will route around them. Enter several stops into the Magellan 760 navigation system on a single trip and the Multi-destination Route Optimization feature will calculate and guide you on the shortest route between them, or in whichever order you choose. Let your Magellan Road Mate 760 GPS system guide you on every driving adventure with a set of advanced features that defies its ease and mobility. ‣Dynamic turn-by-turn voice guidance tells you when to make the next turn. ‣The expansive Points of interest (POI) database provides over 1 million listings in over 40 categories, including restaurants, petrol stations, , historical monuments, parks and more! ‣Built-in infrared communication enables you to send addresses from your IRDA compatible PDA or SmartPhone®. The Magellan Roadmate 760 requires no wiring. Simply plug in the power cord and you are ready to turn it on and go. Lightweight and truly portable, the Magellan RoadMate 760 GPS satellite navigation system is easily transferred from car to car, so you can take it with you wherever you go. The compact size and light weight enable of the Road Mate satnav system you to easily take it with you on business trips or when you change cars. Detailed Magellan GPS mapping of 27 European countries. Navigate much of Europe with no need to download new data to your GPS navigation system. A single seamless database, built-in to the 20 GB hard drive, contains all major city streets as well as backroads and motorways. Includes detailed cartography of the following European countries: Andorra, Austria, Belgium, Denmark, England, Finland, France, Germany, Greece, Ireland, Italy, Liechtenstein, Luxembourg, Monaco, Netherlands, Northern Ireland, Norway, Czech Republic, Slovak Republic, Portugal, San Marino, Scotland, Spain, Sweden, Switzerland, Vatican, Wales. Looking for accessories and spares for the Magellan RoadMate 760? We sell a very limited range of genuine accessories including travel carrying case, protective case, car charger and external GPS antenna. Do you have a question about the Magellan RoadMate 760? Submit your question via our contact page.